We’ve reviewed the XPS 13 a few months ago and we are now back to see how far the successor has gone. Honestly, it’s not much of an upgrade but there are some points to consider given the fact that the new XPS 13 boasts a 6th generation Intel CPU and all the goodies that come with it, especially the USB 3.1 Type-C port available. There’s also the LPDDR3 RAM ticking at 1866 MHz. It looks like Dell hasn’t gone full-on with the newest DDR4 memory but still offers slightly faster memory than the usual DDR3-1600. This will surely affect the GPU performance since the machine uses the iGPU Intel HD Graphics 520. However, we are going to do a full review of the model again since the under the hood changes may have affected the overall user experience, especially in the battery, performance, and cooling system departments. We hope all of these will be at least slightly better than before mostly because of the Skylake CPU on board. Also, it will be interesting to see how the new screen performs because we were quite pleased last time. And finally, it will serve as a good comparison between the 15-inch and 13-inch XPS models since both differentiate not only in size, but in so many ways as well. You can find the notebook’s available configurations and prices at Amazon.com. 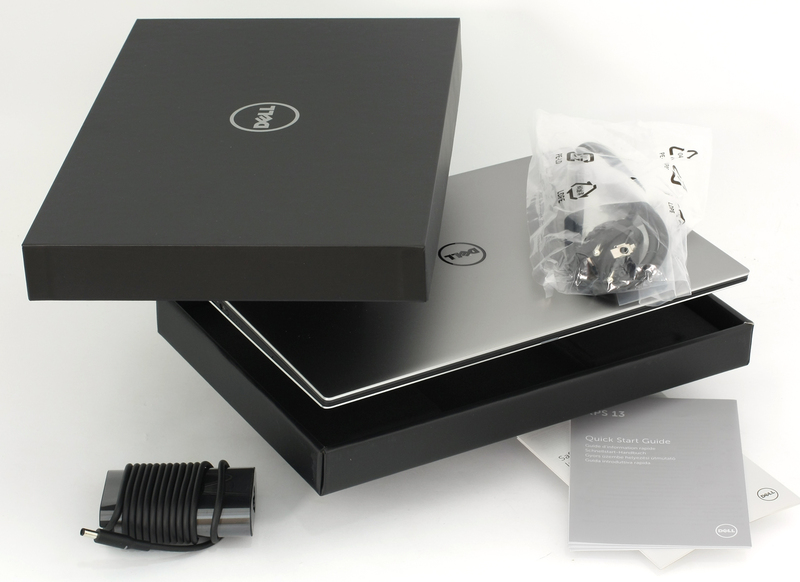 The luxurious box comes with the usual user manuals, AC adapter, charging cable and the notebook itself. 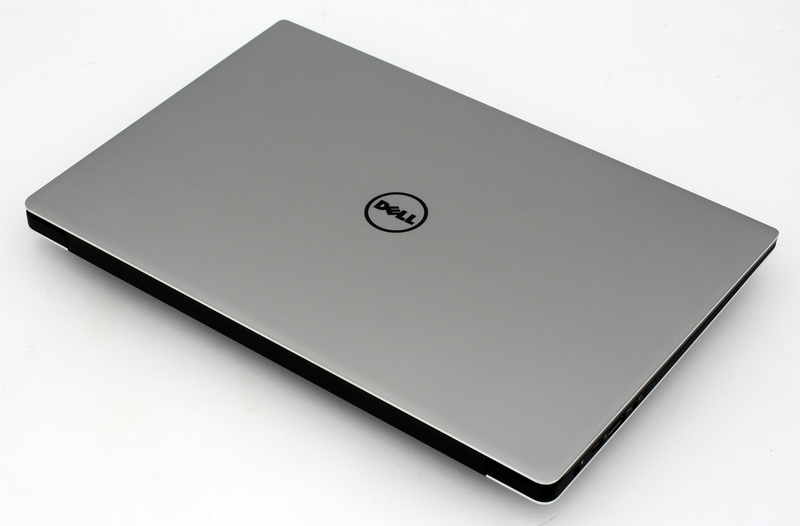 The lid features the same anodized aluminum plate with Dell’s logo in the middle. It doesn’t bend under pressure and feels pretty solid but we’ve noticed that the hinges are too tightly pulled and opening the notebook with one hand isn’t possible. We’ve noticed the same with the XPS 15 but that was understandable since this greatly reduced the screen wobbling when using the touchscreen. Anyway, the version of XPS 13 we’ve got is not touch-enabled so this might be problematic for some. The other side of the lid we find the webcam at the bottom screen bezel since the other three are way too small to accommodate the camera. The ultra-thin bezels around the screen help you focus on the content and reduce the overall size of the machine. 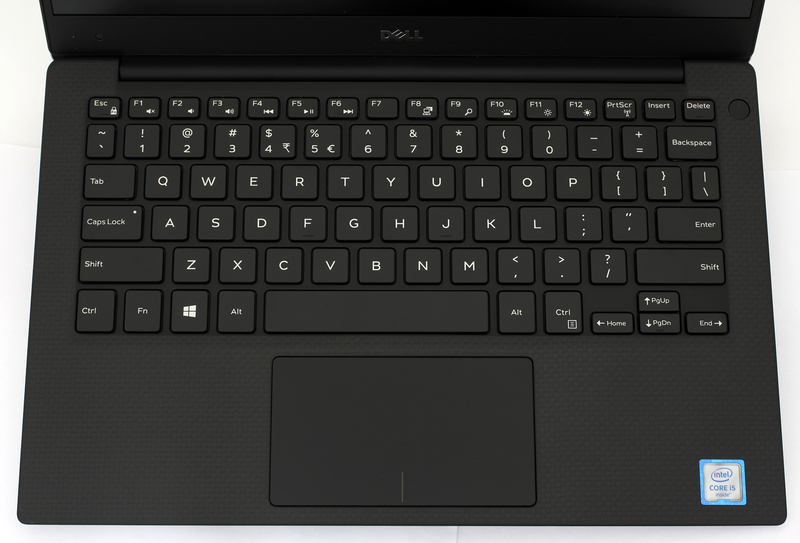 As for the bottom piece, it’s the same as the last model – with big vent openings, two striped silicone legs that keep the notebook in place and a small XPS-labeled cap that hides the usual serial numbers, certifications etc. A nifty way to hide the ugly inscriptions without ruining the appearance. As we go around the sides we noticed that little has been done here. The left side has the DC charging port, one USB 3.0 port, one USB 3.1 Type-C connector, 3.5 mm audio jack and the button that indicates the battery level without opening the notebook. There are 5 small LEDs and presumably each translating into 20% of battery life. The right side incorporates the other USB 3.0 port as well as the SD card reader. Also, both sides have small grill openings near the front for the stereo loudspeakers. We cannot miss mentioning the incredibly thin profile that goes from 9 to 15 mm at its thickest point making it one of the most portable devices out there. However, it seems that only the HDMI port is missing or, at least, mini HDMI connector so you will have to use the USB Type-C, which is Thunderbolt-enabled, for external monitor. The interior is where this notebook shines. It uses the same soft-touch matte rubberized finish around the keyboard and the sides. It’s really pleasant and gentle to touch but attracts fingerprints and smudges quite easily. The carbon fiber composite peeks through the barely transparent material on top that will appeal to most. The keyboard is stretched across the interior with reasonably sized keys that offer long tactile feedback, LED backlight and the much-needed comfort while typing. The same goes for the touchpad, although sometimes it missed small more precise touches and it’s quite loud when clicking. Still, the impeccable build quality has translated into the input devices and the solid interior without ruining the luxurious looks and feel. With the incredibly thin profile, small size (due to the thinner screen bezels) and extremely low weight (1.2 kg) the machine can easily steal the crown of the most mobile device currently on the market. Interestingly enough, this hasn’t translated into worsened build quality, choice of materials or design. Actually, everything about the XPS 13 will make you want it even more. Moreover, the overly tightened hinges may not be the best idea for the Full HD version but they will surely prove useful to those getting the QHD+ touch-enabled variant. 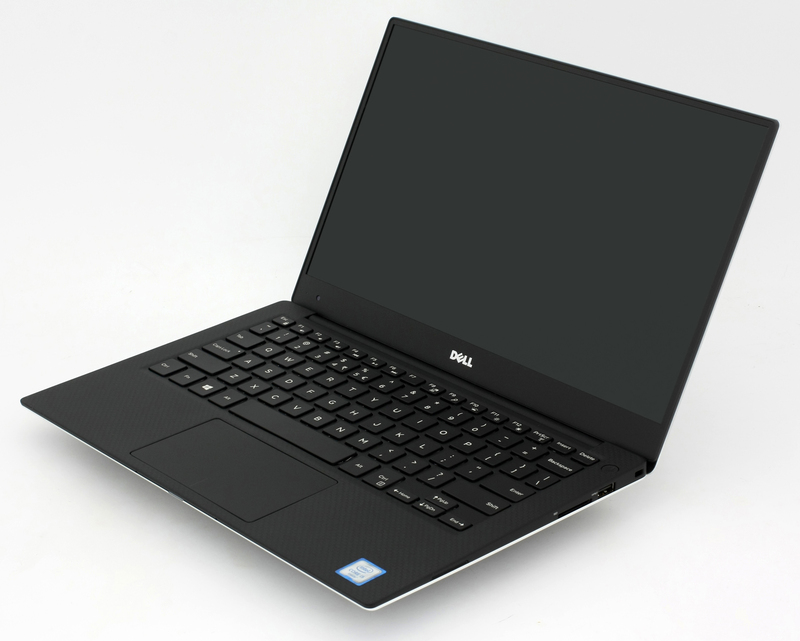 The 15-inch XPS proved this in our review. This one is pretty easy and you can follow the steps here, but it’s important to note that the ultrabook now sports a slightly bigger battery than its predecessor and faster M.2 PCIe NVMe SSD while the old version sports the same M.2 but only with AHCI support. 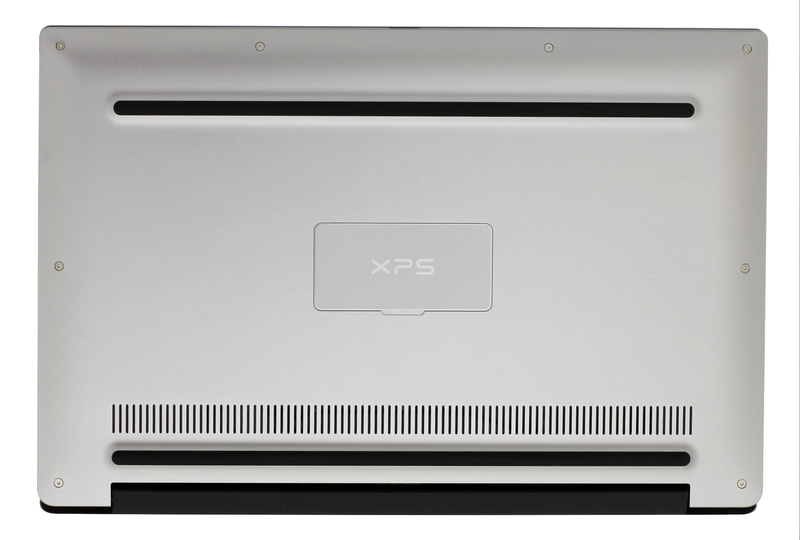 The new XPS 13 features a Full HD (1920×1080) IPS panel from Sharp with model number LQ133M1. It has a 13.3-inch diagonal, 16:9 aspect ratio and a pixel pitch of 0.153 x 0.153 mm. The pixel density is 166 ppi and the panel can be considered as Retina if viewed from a distance equal or greater than 53 cm. Since this is an IPS panel we are dealing with, viewing angles are good. We were able to record only 251 cd/m2 maximum screen brightness with only 5% deviation. It’s rather dim screen for a notebook from this price range. Anyway, the average color temperature on the surface is 7600K so colors will appear a bit cold since the optimal is 6500K (D65). Also, there’s a big deviation in the upper-center part of the screen. 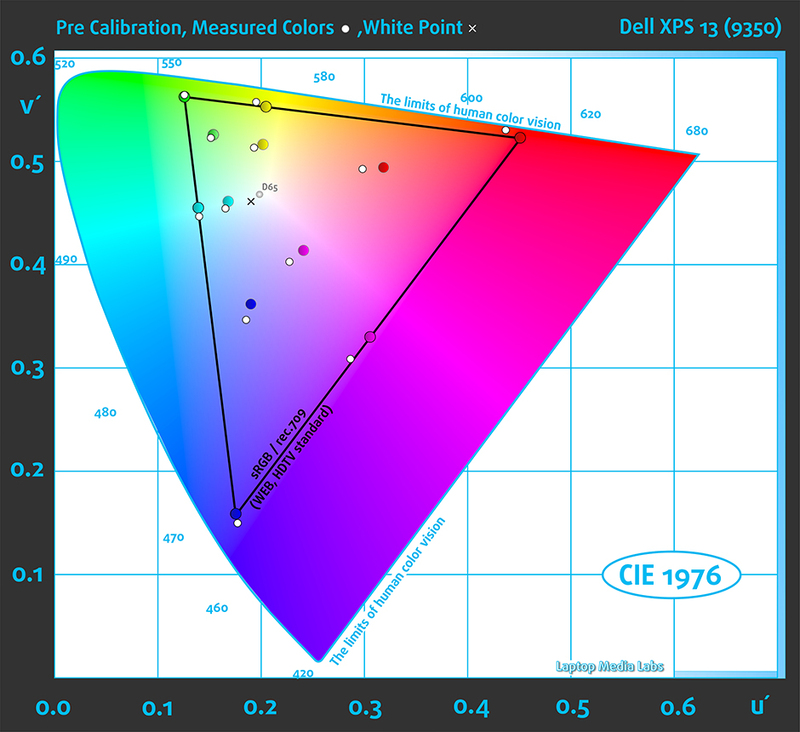 So as you can see from the image below, XPS 13’s panel is able to reproduce quite a big portion of the sRGB color gamut – 94%. This assures better image quality at some extent. You can see the two images below that are practically the same as the one above, but this time, you can see the colors that have 100% and 50% saturation before and after calibration. We calibrated the display at 140 cd/m2 screen brightness and 6500K color temperature. We used X-Rite i1Display Pro for the calibration. We tested the display using 24 commonly used sample colors like skin tones, grass, blue sky, orange etc. The device recorded an average DeltaE 2000 deviation of 4.99 – so that’s not the most accurate display on the market, but it will serve well of users that don’t need it for color-sensitive work. However, the contrast ratio is off the charts even for a high-quality IPS panel – excellent result – 1400:1. You can see another set of colors that we were able to test on the display. The display uses PWM across all brightness levels at a relatively high frequency – 4.9 kHz. But there’s a notable difference between this particular panel and the others on the market. You can see on the graph below that the screen flickering effect is still present even when the screen brightness is set to maximum (251 cd/m2). We think that this problem is either a software issue or a hardware issue, because when the display is turned up at 251 cd/m2, the backlight is turned off nearly 1/3 of the time. With a little math, it turns out that the full capacity of the display isn’t utilized and, in theory, the panel can reach up to 370 cd/m2 if the issue is resolved. This leaves less room for PWM presence and significantly brighter screen that’s usable even outdoors. We are not sure why Dell has put these restrictions or is it even on purpose or accident. XPS 13’s new display has some properties worth considering but also two major flaws. For starters, the maximum brightness is only 251 cd/m2, which is sub-par for an ultrabook at this price range, and that leads to a pulse-width modulation across all brightness levels. If the software (or hardware) issue is resolved, we may be looking at better screen quality and less presence of PWM at higher brightness levels. However, we are happy with the exceptional contrast ratio (1400:1) and wide sRGB color gamut coverage (94%), leaving us with mixed feelings about the picture quality. One thing is for sure, though, Dell hasn’t utilized the full potential of the screen. The sound quality of the notebook is excellent and more importantly, we didn’t notice the annoying metal rattling sound we observed with the 15-inch version. Once again the XPS 13 proved to be a durable little fellow. The huge 56Wh battery inside worked its way to the top of our charts with excellent runtimes. However, there has been a slight decrease in video playback time but the browsing hours have gone all the way up to 9 hours. All tests were run with the usual settings – Wi-Fi turned on, screen brightness set to 120 cd/m2 and power saver mode is turned on. Excellent result – 563 minutes (9 hours and 23 minutes). Although, the video playback times are much lower than its predecessor, the result here is outstanding – 445 minutes (7 hours and 25 minutes). This test got the most of the battery since it’s the most demanding one – 150 (2 hours and 21 minutes). Here you can see an approximate comparison between the CPUs that can be found in the Dell XPS 13 9350 models on the market. 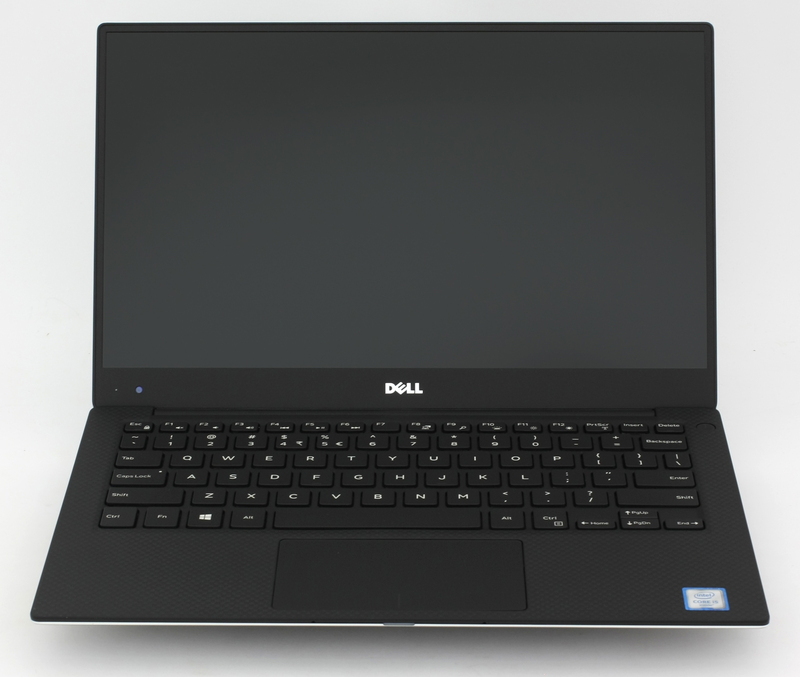 This way you can decide for yourself which Dell XPS 13 9350 model is the best bang for your buck. Here you can see an approximate comparison between the GPUs that can be found in the Dell XPS 13 9350 models on the market. 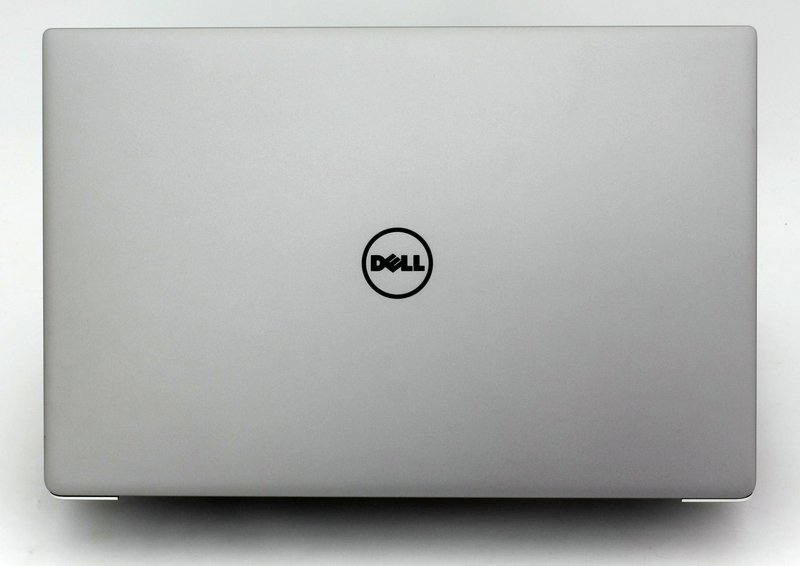 This way you can decide for yourself which Dell XPS 13 9350 model is the best bang for your buck. While this two-staged test doesn’t represent real-life usage, it’s a good way to determine how the system will hold in the long run and how good is the cooling design of the notebook. We do this with the help of 100% CPU and 100% GPU load in around two hours of usage. 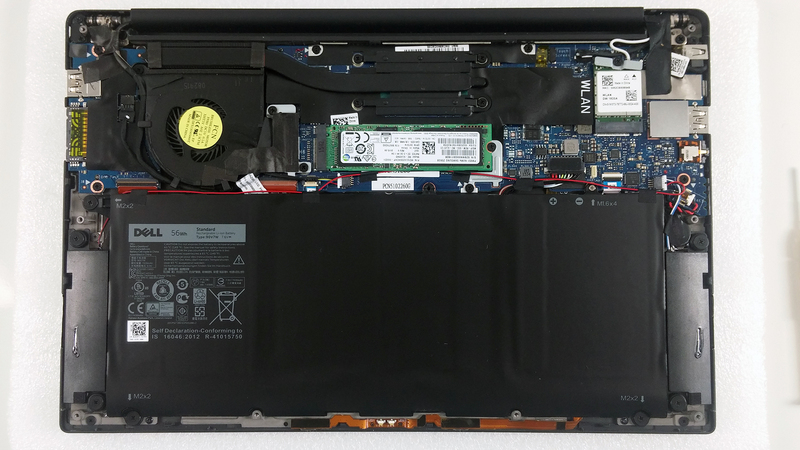 We started off with 100% CPU load for an hour and we were impressed by two things – the notebook appeared to be absolutely silent and the temperatures of the CPU were really low for an ultrabook. 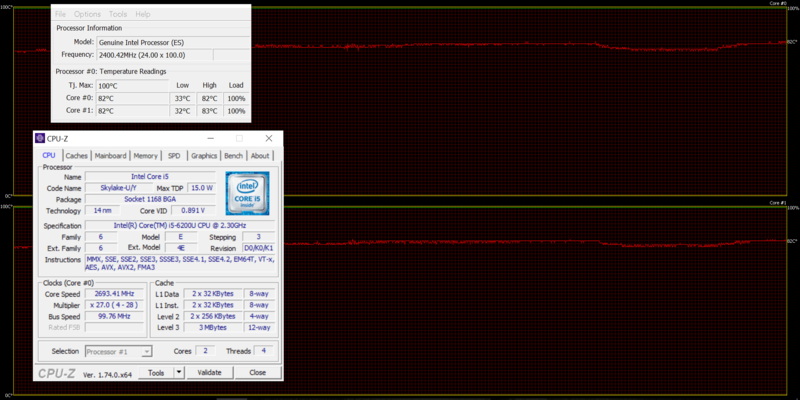 The CPU was ticking at around 2.7 GHz, which is the maximum operating frequency for two active cores, and the temperature didn’t go beyond 83 °C. You can see the graph below – the red line represents the temperatures while the green one stands for the CPU load. As we expected, shortly after we ran the GPU stress test alongside the CPU torture test, the silicon got a bit hotter but not as much – 89 °C. Also, the CPU started throttling at 1.5 GHz in order to keep the internals as cool as possible. This is a quite common occurrence with most ultrabooks and given the duration and nature of this test, we don’t think this would be a problem for the general user. Moreover, the fan was spinning a bit faster but still was quite silent. We also measured the outer temperatures after the long test to see how the heavy load affects the user’s experience. While the top part of the keyboard gets a bit hot we can say that under normal usage the notebook will not cause any discomfort. It’s quite unlikely that you will reach 100% CPU and 100% GPU load for longer periods of time, anyway. The input devices are also comfortable and precise to a point where you actually forget that you are using a 13-inch laptop. Maybe a bigger “Enter” key would have been appreciated. 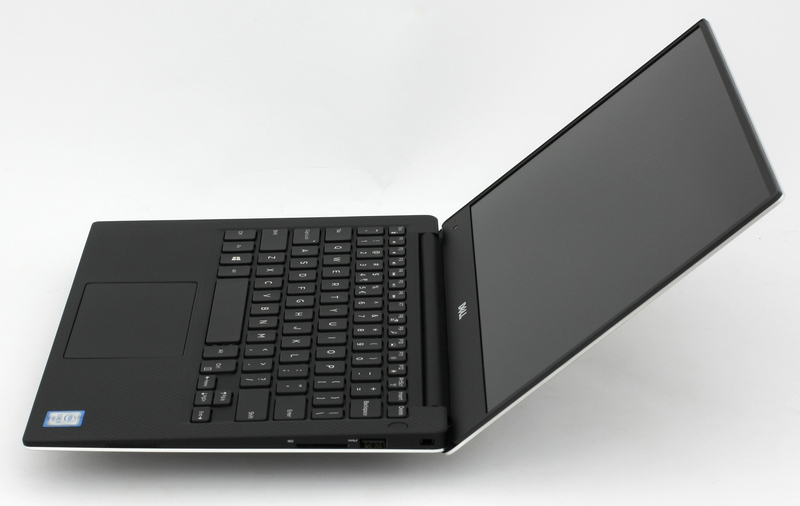 Spec-wise, the notebook offers good hardware, but not as good as it actually costs. 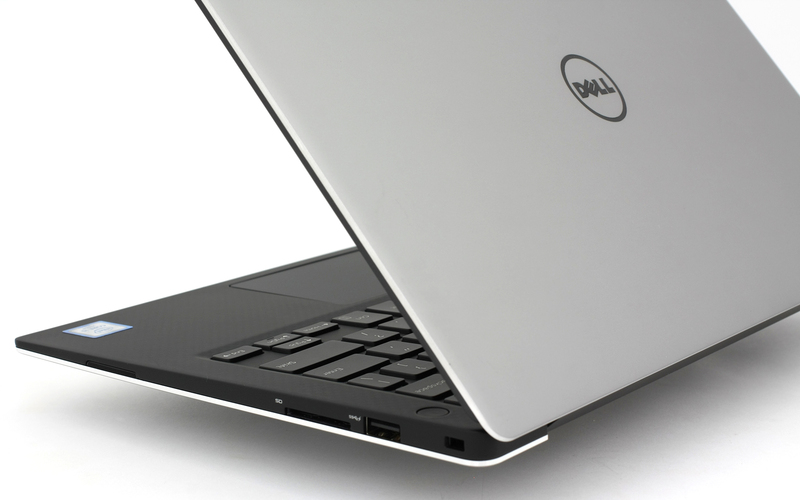 The XPS is a premium line of devices that’s on par with the competition but costs a bit more. Most devices offer Core i7 CPUs while the version we tested has Core 5-6200U chip. However, the battery performance remains unmatched by the competition. Compared to the Broadwell version, the new XPS 13 has considerably lower video playback time but longer browsing runtime. The display, on the other hand, leaves us a bit confused. 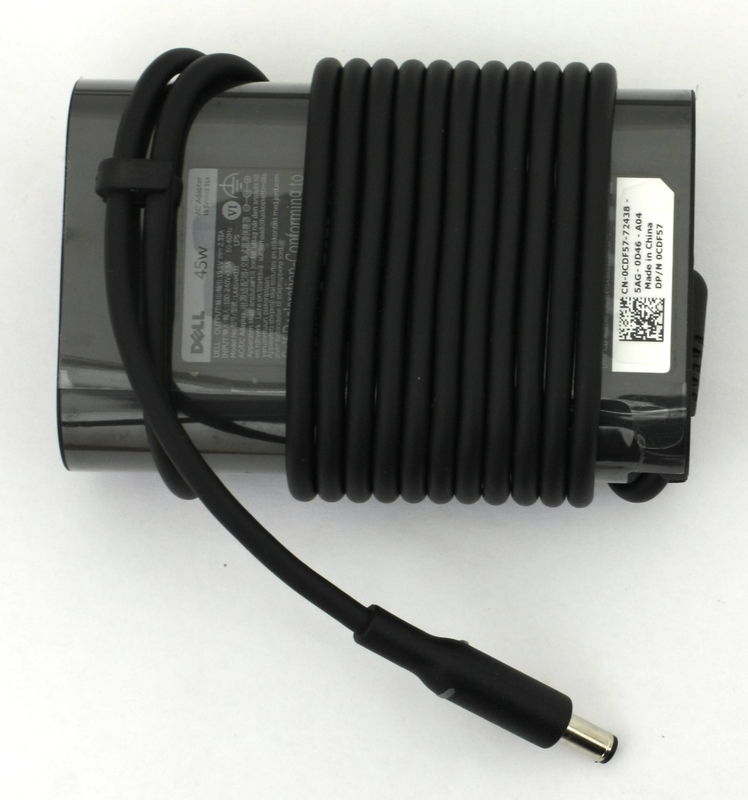 It has two major flaws – its maximum brightness is sub-par and it has PWM across all brightness levels. We mean that last one literally. There seems to be a hardware or software issue that limits the maximum brightness of the display. It should be much brighter and probably lose the screen flickering at higher levels. Also, using an external monitor would be a challenge since the notebook loses the HDMI port and it’s replaced by the future-proof USB 3.1 Type-C so you have to find a Type-C-enabled monitor or adapter. Finally, the cooling system is effective and keeps things cool and quiet. You can barely hear the notebook running giving the feel working on a fanless ultrabook. You can find the notebook’s available configurations and prices at Amazon.com<. It was suggested that the PWM was caused by Dell’s Content Adaptive Brightness Control. The PWM should not happen if the screen is only displaying White color only. They released an official firmware that removes the feature just a few days ago on its support page. Is it possible that you guys test the display PWM again with the new firmware? The qhd+ panel on the XPS 13 is an IGZO panel, like the one on the Acer R13 and the Alienware 17 R3, and should be relatively PWM free. the firmware only works with the qhd panel. dell is not working on a solution for the matte fhd display right now. 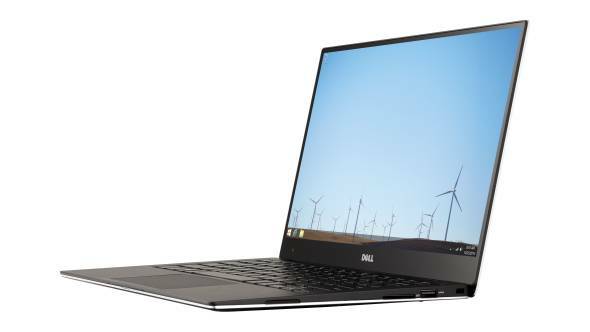 Will you be reviewing the new XPS 12? Would really appreciate if you guys could review the 9343 or 9350 XPS13 with the QHD+ screen!